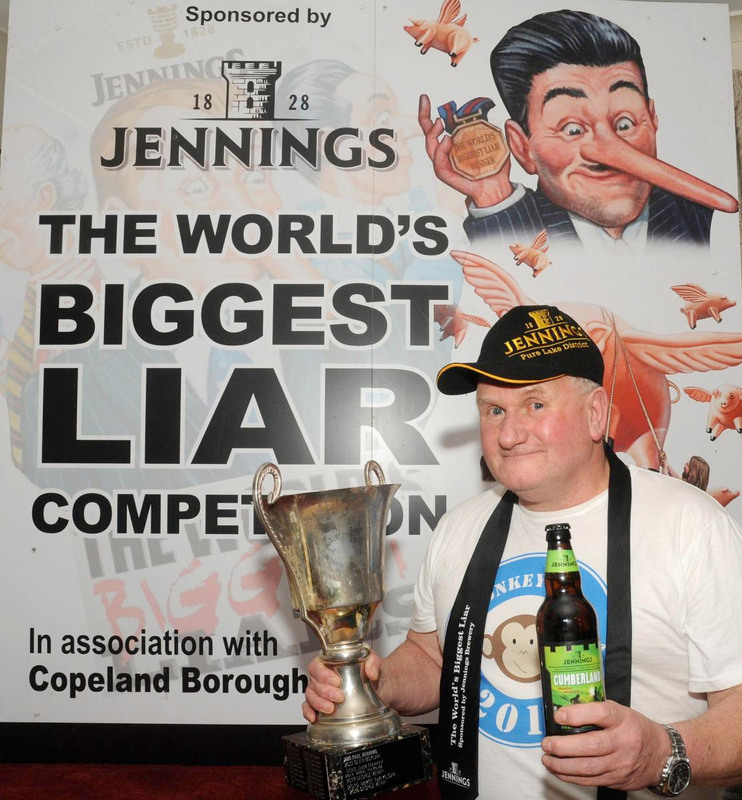 Top fibber Mike Naylor has been named the World’s Biggest Liar for the sixth time – and that’s the truth! 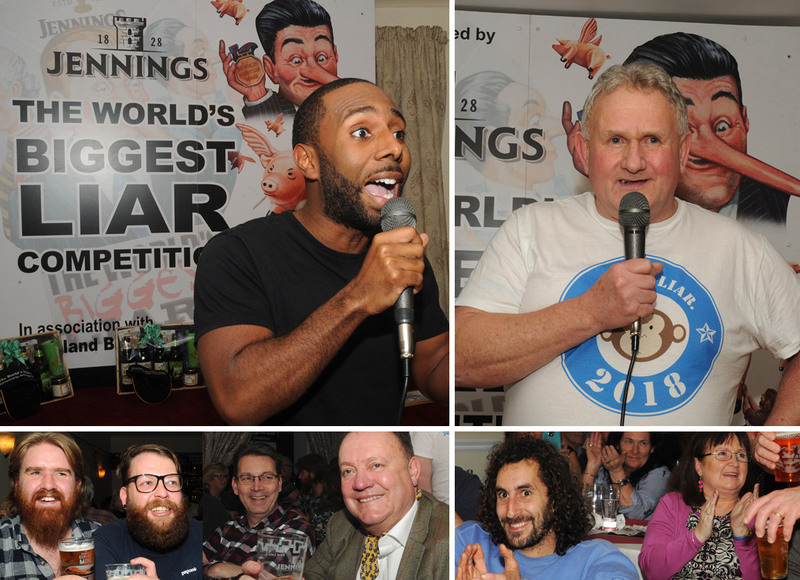 Known as Monkey Liar, the veteran competitor, from Keekle, held on to the trophy, entertaining the crowd at the Bridge Inn, Santon Bridge, with his tale of tackling a three peaks challenge with a twist. Mike, 62, and Will Ritson, whose memory the con-test is held in each year, took an action-packed journey up the Matterhorn, the Eiger and Mount Everest on a four-wheel drive, tandem segway. The pair were accompanied by a cat wearing a head torch, their “cat-a-light navigation system”. Mike only had two Wasdale flags to plant on the mountains’ peaks so had to use last year’s Biggest Liar winner’s tie on the Eiger. “It’s the tie on the Eiger,” he said. “I struggled this year. I came up with it just two weeks ago – I woke up with the idea. Maryport’s George Kemp claimed second place with his tale about swimming the Solway Firth, from Silloth to Whitehaven, with Prince Charles while John Rooney, aka Spartacus, from Kendal, came third. The panel of judges included mountaineer Alan Hinkes OBE while Margaret Ritson, 68, who currently lives in London, and her sister Pamela Emberton, 66, from Tauranga, attended as they are in the area researching their family history. The pair, who are on a week-long trip, arrived on Wednesday. Mike said: “With the Ritson family here and Alan Hinkes having climbed Everest, it couldn’t have fell better.” And Alan said: “It’s my first time here, I’ve wanted to come for ages. As a climber, I’ve heard all the history about Will Ritson. “It’s a pleasure to be here. I thought it might be traumatic picking a winner but there was no arguing. “It’s been great, I love the Cumbrian accent, there’s similarities with Yorkshire and the North East. It should be promoted more to get some southerners to compete.” Chuckie Lophian, from media company Vice, who were filming the event, also took part as well as Richard Croft, from Langdale. The top three donated their prize money to Hospice at Home, who raised £164 through a raffle.